Limenas quite simply means “the port”. 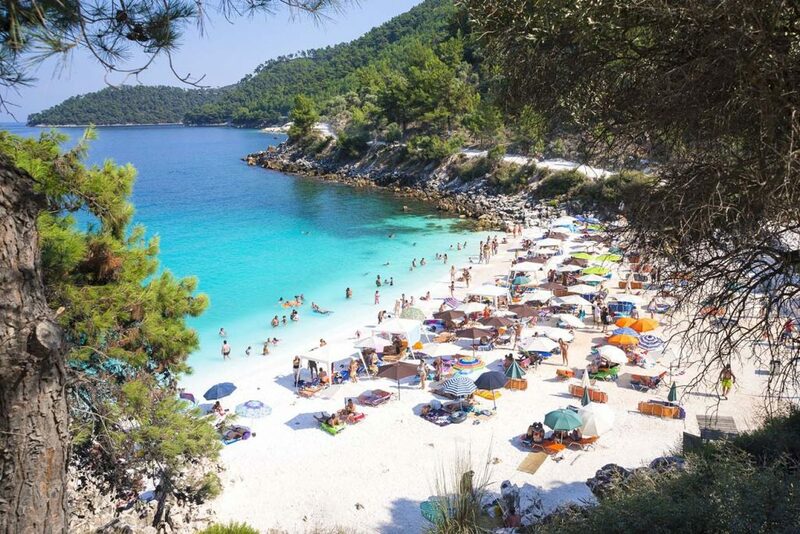 It is the capital of the island and is commonly called “Thassos Town”. It’s the home of the main harbor from which you can easily travel to and from mainland Greece via the ferry port of Keramoti. The village offers a wide variety of attractions and activities, many more than can be undertaken in one short holiday! It is in the northerly part of the island, surrounded by the densely wooded pine green mountains, and large swathes of olive groves, making the whole a very picturesque setting. It is just a short distance from mainland Greece, where the city of Kavala can be clearly seen, both during the daytime and at the night-time when it is wonderful to watch the lights of the town and of the villages around. From Limenas one can enjoy spectacular sunsets, as the sun dips behind the mountains, while enjoying a cool drink in the evening warmth. In the village itself and all around it there is a wide choice of beaches where you can swim and relax after a day of exploring the old part of town. The nearby beaches are the old town beach (Limanaki Beach), Makryammos Beach, Nisteri Beach, Agios Vasileios Beach, Tarsanas Beach, Glyfada Beach, Papalimani Beach and some other small beaches in between. These are all sandy beaches and all have facilities for the thirsty and hungry tourists, many of them also providing sunbeds and umbrellas, showers and changing booths and toilet facilities as well. They can be reached by foot, by the around-the-island bus, or by car or taxi with adequate parking at all of them. Limenas is the commercial centre of the island. All the government offices, the utilities, the major Greek banks, and the offices for the ferries, the buses and the port police and customs are located here. It can get busy even in the quietest days of winter. Thassos Town has shops, kiosks, stalls and even street vendors, supplying all the needs of the visitor. There are restaurants that cater for every single taste and pocket, in a wide range of prices. Cafés, traditional coffee shops, bars large and small, quiet and cozy, discotheques, quiet beachside bars, and in fact facilities to cater for every age and every taste. The shops here range from small souvenir shops selling some of the original Greek folk art, right up to some very smart clothes shops with the latest style clothing, shoes and accessories which would not look out of place on high streets in some of the larger cities. There are supermarkets with the full range of international goods, and small corner shops which are family run, who provide local and fresh produce and will happily provide sample tastes of some of the more unusual products, then take your order and deliver them to your door. The village boasts three harbors. The harbors have facilities for all vessels and attract some very fine boats and yachts of all sizes throughout the season. In the winter, the ancient harbor is full of the local fishing boats. The harbours and the marina provide an attractive diversion for those who enjoy just strolling around and admiring the beauty of some of the crafts that dock there. By ferry it is only 35 minutes from the port of Keramoti on Greece’s mainland. Ferries run frequently every day, particularly during the summer, and so access is quick, easy and comfortable. For the very rare stormy winter days, there is a fully enclosed ferry which is usually still able to make the crossing, so the island is connected with the mainland year-round. Limenas has a very rich and interesting history. There are numerous archaeological discoveries – some still being excavated and explored – inside and all around the village. From just outside the walls of the ancient city, everywhere, in and amongst all the modern developments, there is evidence of the ancient past – how the people in this town lived – the way of life that was imported into Thassos from other Mediterranean areas, and the influence that had on the rural Thassian life at that time. Today, treasures and fragments from Thassos and other antiquities can be found, not only in the local museum here on the island but worldwide in some of the most prestigious museums such as in the Boston Folk Museum, Istanbul and the Louvre.